The main ingredients of our cuisine are “memory” and “identity” because these are what constitute the old and simple recipes of this region. 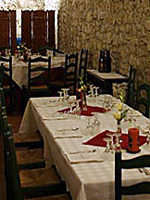 The first courses include homemade pasta and vegetables soups. The second courses are based on beef and mutton straight from our pasture lands; in winter, until supplies have been exhausted, the restaurant offers the traditional local produce of pork. Pecorino cheese, mozzarella and other tasty cheeses from sheep and cow’s milk will tease your palate, complimented by homemade, wheat, spelt, wholemeal breads baked in wood-fired oven. Fresh vegetables and fruit enrich our table, together with the black truffle, saffron, red chillies and the traditional cakes and biscuits such as the crunchy amber-coloured ferratelle, the sugared nuts or the soft sponge cake. Guests can taste our D.O.C wines, from the vineyards of our region, and the spirits flavoured with herbs, soft fruit, wild cherries and fresh nuts.